I have a flat in London that’s been rented out for years. But I’ve recently started some renovation work, which I’ll be reporting on over the next few months. The first job has been repairing the windows. They rattled and in some places had large gaps, which let the air in and the heat out – see picture above. Some of the sills were rotting too. I found a company called Sash Repairs, and asked them to do the job. You might wonder why I didn’t replace the windows and put in double glazing. But if you look at the English Heritage website, you’ll see that this isn’t what they recommend – and they say it doesn’t make sense environmentally either. They pointed out that many sash windows have been in situ for over a century, whereas plastic replacements may only last a couple of decades. Then you have to think about the energy inputs in making new windows, and what happens to them when they’re discarded. My sash windows weren’t just repaired, they were draft-proofed as well. I’ve learnt that repairing them can cut draft loss by 30%, and draft-proofing, by 90%. I can’t tell you how much energy has been saved by the measures I’ve taken because the flat is occupied on a rather haphazard basis at the moment. But I can say that the windows don’t rattle any more – and cold air isn’t rushing in through the gaps. I’ve now employed an eco-architect, Jerry Tate, who has already come up with some interesting ideas. A key part of the brief is to eco-renovate the flat, so that it’s green credentials are a key part of its attraction for the rental market. That means, whatever changes are made, they’ll need to be both super efficient and easy to operate. This entry was posted in About me, Green Building, News 2010, Projects. Bookmark the permalink. 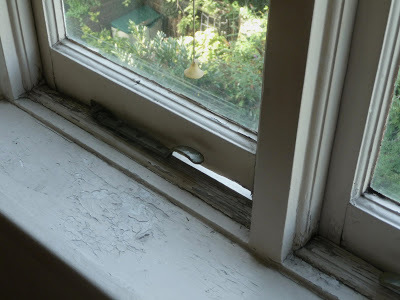 Sash windows are almost always repairable. The myth does still exist that replacing is better than repair although more are informed daily of how they can be upgraded. Afterall most do still want to keep thier original windows! Finally i found what i was looking for and i would like to recommend it to all my friends." This looks like comment spam (anonymous, no substantive connection between the text of the comment and the text of the post), but I can't for the life of me figure out what USE it would be to the spammer.